Pro Armor Bumpers are known for toughness and durability. Bumpers are about more than just protection, a bumper is the mounting point for winches, the mounting point for lights and the accessory that makes the biggest impact to the look of a vehicle. 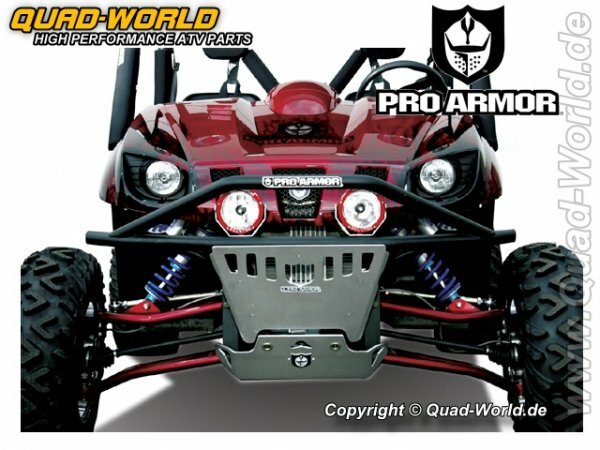 Designed to work with the Pro Armor Winch/Fairlead Kit (PA-Y074019), and Front Bumper Skid Plate Winch (PA-Y074018). Made from thick stainless steel tube and then polished to perfection, these massive bumpers are the best bumpers for your Rhino, period. Available for the Rhino 660 and 450, the Pro Armor Rhino Bumper is a tough, take-no-prisoners bumper perfect for all Rhino enthusiasts. Weiterführende Links zu "Pro Armor FRONT SKIDPLATE für Yamaha Rhino"
Kundenbewertungen für "Pro Armor FRONT SKIDPLATE für Yamaha Rhino"